Today, I have something a little different to share with you. Instead of sharing more about my family’s debt free journey, I have a special guest who has agreed to share his debt free story. Ron Noble tells how he and his wife Thu paid off $167,500.00 in seven years! They are a true debt free family because they have paid off all of their debt including their house! Continue reading to find out how they did it and what they have been able to do since becoming debt free. ME: Thanks so much for agreeing to share your story with Our Debt Free Family! Please tell us a little about yourself so we can get to know you. Ron: Hi, my name is Ron. I am 50 years old. I have been married for over 20 years, and I have a stepson who is 35. I live in southern California. ME: It’s nice to meet you! What made you decide to focus on becoming debt free? Ron: I had a hard time getting employers to pay me what I was worth. I consistently outperformed my co-workers yet always ended up getting a lower wage mostly because “I speak my mind.” I decided that even though my income was not that great I would go far beyond anyone around me by becoming debt free. ME: That’s a great goal! How much debt did you pay off, and how long did it take you? Ron: We paid off $167,500.00 in seven years, but we paid most of it in the last two years. ME: What kind of debt was it? Ron: Our mortgage was $150,000.00. We had credit cards and furniture that totaled $7,500.00, and our car loan was $10,000.00. ME: What did you do for work while you were paying off your debt? Ron: I was an electronic tech for about thirty years in the satellite/aerospace industry. Now I am a web designer/Internet marketer. ME: What was your annual income during this time? Ron: It varied wildly as I got laid off and was activated in the military from the reserves. I would say it was between $50,000.00 and $100,000.00 per year. ME: Did you do anything to increase your income during this time? Ron: We bought items at government auctions and sold them on eBay. ME: Interesting. What sacrifices did you make when you were getting out of debt? Ron: We didn’t eat out much, and we only went on inexpensive vacations. ME: What are your top money-saving tips to share with us? Ron: Cut down on expenses. For example, replace your landline with MagicJack, and replace cable with streaming video such as Roku. I drove a VW bug “76” even though I had a Ranger because I was running the bug for $46.00 a month. I parked the Ranger on the base and left it so I only needed liability insurance. ME: Those are some great tips! What advice would you give to someone considering starting their own debt free journey? Ron: Plan your work. Work your plan. Your plan will work. Pay off high interest short-term loans first and use the money after you pay to build a snowball for wiping out the next debt. After all of your consumer credit is gone, start paying down your mortgage. It is important to realize that when you make payments on your principal, you are taking away the debt that the bank can charge you interest on. I had my bank recalculate my payments every year as though I was going to pay them for the full term of the loan. This lowered my monthly payments and guess where my savings went. Yes, toward the principal. The lowered monthly payments gave me more flexibility. It is best to start your program in the first seven years of your loan when your mortgage payment is almost 100% interest. I have heard that if you make one extra payment a year you can cut your mortgage from 30 years to 22 years. Be careful about refinancing. While you may get a lower monthly payment or better interest, the way that banks amortize the loan you start paying almost 100% interest again. Most people never pay off their house and retire with a mortgage. Most people change houses every 5-7 years. Remember when I said the bank gets theirs in the first seven years? Lastly, don’t view becoming debt free as hard, boring, or laborious. If you are like me, once you get started you will start to feel so good knowing that in a few years you can quit a job in the middle of the week and not even care because you are debt free and have money in the bank! 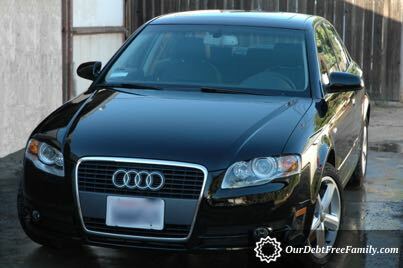 Ron and Thu bought this Audi with cash! ME: Those are some really great insights! Have you made any big purchases with cash since becoming debt free? If so, how long did it take you to save up? Ron: I bought one high-end German car. It took about a year and a half to save up for it. After I bought it, I started saving for Wifey’s German car – an even better car. That took two years. The thing to remember is to save for your next car while driving your new car instead of driving your new car while paying for it. This means the people at the bank have to buy used cars because you’re not paying for their cars. ME: That’s great advice! Paying cash is definitely the way to go. So from your experience, what is the best part about debt free living? Ron: Security – not feeling like the bank is going to repossess everything if you lose your job. Before I became debt free, I was laid off from my job, but I was able to pick up some contract work to get by. Once I became debt free and my contract ended, I decided to decline more contract work so I could start my own business. Now, I don’t have any debt, I have money in savings, and I am working for myself instead of someone else. This is my American dream! 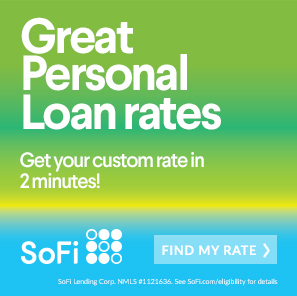 If you’ve come to Our Debt Free Family because you think about going with SoFi. They have really solid customer service and low cost. So you have have a pile of debt you’re working through they might be worth checking out. You can to their page here or access the banner below. Ron and Thu Paid Off $137,000 in 7 Years – And You Can Too!!! What an inspiration Ron is, I love the quote about working your plan, I could see that on a wall in my office! I agree. I love that quote! I am so happy that Ron shared his story with us! This is a great getting out of debt story. I think the fact that they didn’t give up when Ron was laid off and their income decreased is so inspiring. I also like the tip of cutting back on expenses. We gave up cable years ago. We can afford it now, but it’s just not important any more. We pay with cash and are debt free too. It’s so nice. I am right there with you, Shelly! My husband and I have never had more than basic cable together, and we currently only have a digital antenna to get the local channels. We have Netflix for movies and TV shows and find that’s all we need. Personally, I would rather indulge in a book than a TV show or a movie. Great job on being debt free! We can’t wait to join you! I like how he learned how to supplement his income by buying and selling on eBay. I agree, Candace. Ron got resourceful to achieve his goal of debt freedom. I love it! Wow, that comment about making just one extra payment on the mortgage cutting out so many years of other debt paying was an eye opener! It is amazing! I linked an extra payment calculator in the post. The results will vary depending on the loan amount, interest rate, etc., but it is incredible how paying even paying a little bit extra can save you a lot of interest in the long run! That’s what happens when you speed read! You end up thinking the remaining mortgage is the original mortgage:P Thanks for the clarification.